This award was established in 2011 by the Pittsburgh Coal Mining Institute of America (PCMIA) to annually recognize the service of the President to the PCMIA. The award consists of a commemorative self-standing acrylic plaque that is presented at the annual luncheon of the PCMIA which is normally held in late October. This award is made to the current outgoing President of the PCMIA at the annual PCMIA luncheon which is normally held in late October of each year. It is tradition that the recipient(s) make a short impromptu acceptance speech following the receipt of the plaque. The PCMIA will also recognize those who served as President of the PCMIA prior to current year in the Annual Meeting Program Book. 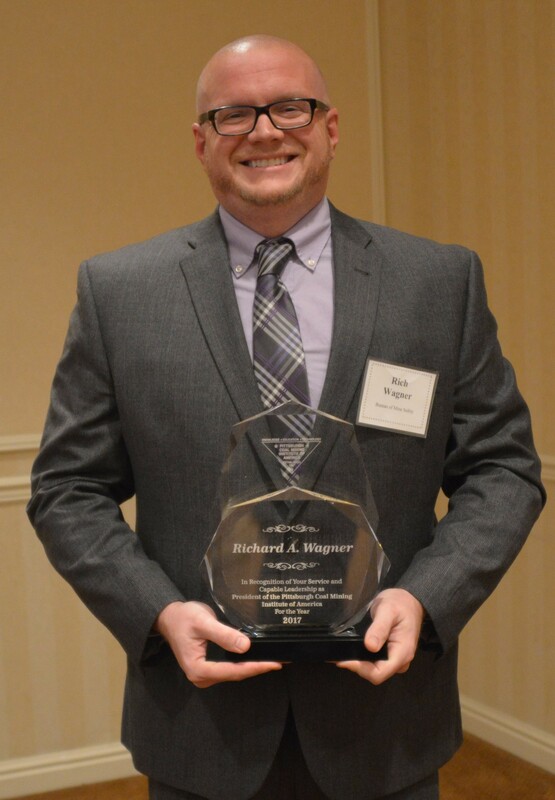 Rich successfully filled the role as President of Pittsburgh Coal Mining Institute of America in 2017. 2009 | James Hickman Roxcoal, Inc.
2003 | Jim Szlalankiewcz T.J.S. Mining, Inc.
1991 | Marshall Hunt Consolidation Coal Co.